Vinod Taank spent his first year at the Tata Institute of Social Sciences, Mumbai interning as part of his rural field exposure program. Through the program, Vinod observed the many challenges faced by rural tribal communities in India’s Jhabua district. The goal of the program was to develop an entrepreneurial solution to a major issue he saw in the communities he visited. After much research, he landed on an idea to create employment opportunities through the commercialization of a local breed of chicken, the Kadaknath "black" chicken. Vinod and Sushil in one of their Kadaknath "black" chicken coops. Vinod and his brother Sushil Taank decided to take the idea to the next level. They began working full time to get their social enterprise off the ground, researching, pilot testing and developing the business model. In 2016, they incorporated their company, TaankBrothers Ventures Pvt.Ltd. TaankBrothers Ventures aims to create self-sustaining employment opportunities by providing training and market linkages to farmers and rural families so they can farm Kadaknath poultry on a commercial level. Their goal is to provide an income source that will allow families to settle back into their rural communities, rather than relocating to overpopulated cities. 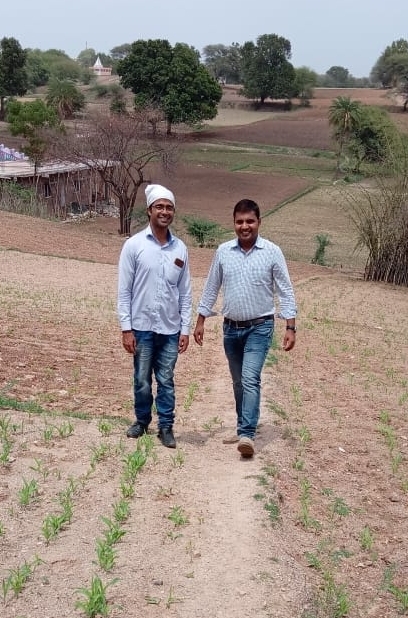 Sushil Taank giving Upaya's Amit Choudhary a tour of the farm. TaankBrothers Ventures is a participating company in Upaya’s 2018 Agribusiness Accelerator. Our team visited the company and spoke with Vinod about his vision for the company. Q: Describe the problems tribal communities face in the Jhabua district. Q: What has been your biggest accomplishment so far? Q: What has been your most important learning so far? “First, when you want to move fast for the success of the business and for the scale and the growth of the business, we need a team of good people with passion and similar goals and ambitions. If you don’t have that team then it becomes very hard to manage the business at various ends. We cannot do everything by ourselves. Second, availability of capital at the right time at right place is very crucial for leading a business. TaankBrothers Ventures Pvt. Ltd. is a social enterprise focused on breeding indigenous Kadaknath "black meat" chicken with the involvement of tribal communities to produce self-sustainable employment and livelihood opportunities in the Jhabua district. They aim to eradicate poverty through rural poultry farming on a commercial scale to enhance the socioeconomic development of the region.